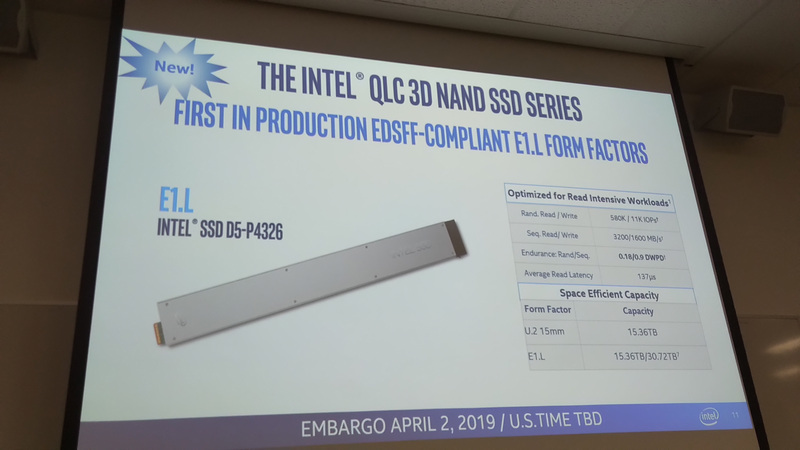 Slipped in to the briefings for Intel's mountain of announcements today are two new enterprise SSDs at opposite ends of the product line: a new Optane SSD and a new QLC NAND SSD. The new Optane SSD DC D4800X differs from the existing P4800X by adding support for dual-port PCIe operation (for high availability) when attached through a PCIe fabric that provides redundant data paths. 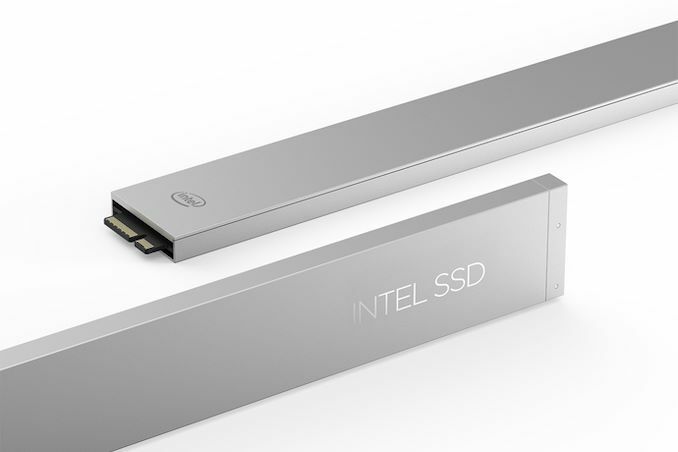 Most of Intel's NAND-based enterprise NVMe SSDs have dual-port counterparts, but this is the first time this feature has shown up in the Optane product family. Dual-port support is a relatively niche feature, to the point that many of the current-generation dual-port drives aren't listed on ark.intel.com, and we don't have detailed specifications. Performance will be a bit constrained when using just one of the PCIe 3.0 x2 links, but most of Optane's advantages in latency and random IO throughput will be retained. While the performance-oriented P4800X is available in both U.2 and add-in card form factors, the dual-port capability only makes sense for the hot-swappable U.2 form factor (and potentially EDSFF in the future). The addition of the dual-port Optane drive indicates that Optane SSDs are reaching a broader audience that now includes mission-critical systems that need high performance but aren't seeking maximum performance to the exclusion of all other factors. Intel's lineup of enterprise/datacenter SSDs that use four bit per cell QLC NAND flash memory is also expanding. Joining the 7.68TB SSD D5-P4320 announced last fall is the new SSD D5-P4326 with 15.36TB and 30.72TB usable capacities. Intel claims these are the first drives in production that comply with the EDSFF E1.L form factor standard, derived from Intel's earlier "Ruler" concept. The smaller 15.36TB capacity is also available in 2.5" 15mm U.2 form factor. That 15.36TB model was mentioned earlier this year as available for "limited deployments", but Intel is now ready to scale up their efforts. Compared to Intel's 7.68TB P4320, the larger P4326 drives have improved random read and sequential write performance, while sequential read performance is unchanged and steady-state random write speeds fall significantly to just 11k IOPS. These drives offer the lowest performance and endurance but highest density in Intel's SSD product line: the 30.72TB model allows Intel to reach the goal of 1PB (raw capacity) of flash storage in a 1U server, thanks to the slim EDSFF form factor. Performance per TB is down relative to the smaller P4320, so the P4326 is even less suited for storing hot data, but it still offers a compelling performance advantage over mechanical hard drives, and the write endurance does scale in proportion to capacity: 0.18 drive writes per day for random I/O, and 0.9 DWPD for sequential I/O. If anybody know better price for Intel D5 P4326 15.3TB 2.5in U.2 let me know. I’m a consumer and I want big (7TB+), fast (U.2) and cheap. Now Samsung PM983 7.68TB is the cheapest 3000MB/s big SSD. Personal video, photo and music and I also like all my folders frequently check for data integrity using HashCheck (one folder) or SFV Ninja (all folders at once). ... And the reason why you need to have 8TB of storage directly tied to your local computer is...? Instead of a separate NAS PC that can manage your data (which you can access over your home network), which comes with the benefit of redundancy and without the need to dump so much money into one big ol' drive which can randomly die with your data on it? Any person dealing with mass data bigger than a 3TB 3.5" drive might better be served by having their data managed by a dedicated network storage PC of sorts. SAN/NAS/whatever. You don't really want to deal with massive single drives because they pose an absurd risk and can cost more $/GB, making growing your storage pool prohibitive. Even in RAID arrays, the act of rebuilding a massive array can cause massive strain on the working drive(s) inevitably leading to another bad sector which can cause the rebuild to fail and your data to be lost with it. I agree, that it is not the cheapest solution, but it is something that I trust and like for comfort, simplicity and control. SAN/NAS/whatever need place, connection cable (I do use WiFi for better health) and I like total silence, so it would have to be in another room. I use trusted PSU: Seasonic PRIME Titanium 600W Fanless (SSR-600TL) with 12 years warranty and I will change it probably earlier, so I minimize risk. SSDs have also their own warranty. "Just like food additives, there are everywhere and can not be avoid completely, but less is always batter than more."